A coalition of health organizations wants to quadruple the tax on a pack of cigarettes in California to boost funding for a variety of health programs. The per-pack tax would jump by $2.60 under an initiative the coalition hopes to place on the November 2006 ballot, supporters said Tuesday. If voters approve the proposal, California's total tax on a pack of cigarettes would rise to $3.47, the highest in the nation. The initiative combines tobacco tax measures from the California Hospital Association and the American Cancer Society. The new campaign includes the American Lung Association of California, the American Heart Association and the Campaign for Tobacco Free Kids, among others. Revenue from the higher tax would be directed to various health programs, including cancer screening, prevention and research, low-cost children's insurance, and tobacco education and cessation. Because the extra per-pack tax would be expected to curb sales, the proposal allots $159 million a year to offset any loss of revenue to programs supported by an initiative approved by voters last year. That measure added a tax of 50 cents a pack to fund early childhood education. The initiative also would give money to local law enforcement to enforce tobacco control laws, which critics said would be needed to offset an expected rise in black-market cigarettes. Raising the tax by such a large amount might lead some people to quit smoking, said Craig Fishel, spokesman for North Carolina-based R.J. Reynolds Tobacco Co.
"But more likely what you have is people looking for other means to get their cigarettes, usually from other states or on Indian reservations where excise taxes aren't enforced," he said. The increased revenue that the initiative's supporters are touting also would be short-lived, said Larry McCarthy, president of the California Taxpayers Association, an anti-tax group. 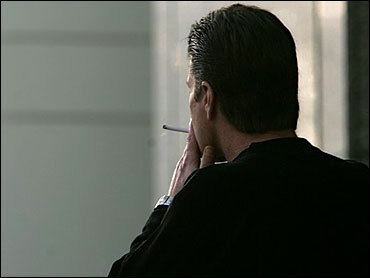 If people can't afford to smoke, they'll quit or buy illegal cigarettes, reducing the amount of taxes collected, he said. The tax is projected to raise $2.7 billion annually if cigarette sales remain at the current level, but the higher price is expected to cut sales by about 8 percent a year, supporters said.